The Department of Transportation (DOTr), its attached airport regulatory body Civil Aviation Authority of the Philippines (CAAP), and local government officials broke ground Tuesday in Coron town for the inception of the estimated P953 million Busuanga Airport Development Project (BADP). The BADP seeks to transfer and expand the Francisco B. Reyes (FBR) Airport in Busuanga, which could only cater to smaller aircraft, to a new location within the Yulo King Ranch (YKR) in Coron municipality. He said the BADP envisions an access airport with a 2,500-meter runway in a 300-hectare land property within the YKR in Coron town. The FBR is classified as a Class 2 principal or minor airport by the CAAP serving the general area of Coron, sharing with the neighboring municipalities of Busuanga and Culion. The ₱953.4 million airport development project, which involves the construction of runway embankment and re-orientation of the airport’s runway was put in place to improve the airport’s facilities and make way for its utilization by bigger types of aircraft. A runway re-orientation was deemed necessary as both the approaches of the airport’s existing runway are facing the mountains. The airport handles at least 16 domestic flights daily from carriers, Cebgo, PAL Express, Skyjet, and Air Juan. An airport that is not only beautiful but also bigger and better, he said. “So when this airport will be finished, the traveler will be captivated from the moment his feet touches the ground. Kaya sa pagtatayo natin ng paliparan na ito, tayo ay nakatuon sa isang layunin, na ang paliparan na ito ay hindi lamang pinagsama-samang kongkreto, kahoy, at bakal, kundi isang paliparan na animo’y pulang karpet na nakalatag sa paraiso,” Rep. Alvarez said. Rep. Alvarez said many have said there is no need to modernize the FBR airport because tourists will visit the Calamian because of its fascinating beauty that is so strong, people will cross oceans just to be in the area. “My answer is this, if we build this airport, more people will come – mas marami pang turista ang dadagsa sa atin,” he said. He said last year, the Busuanga airport handled 20 flights a day or almost double the figure five years ago. A quarter of a million travelers used it last year. He said in three years, they project the annual passenger volume to hit half-a-million. “In less than a decade, this airport could hit the million-passenger a year milestone. Coron and El Nido, Palawan are in the bucket list of every global traveler. Our place is so photogenic that tens of millions of laptops, cellphones in the world today have one of the iconic photos from here as their screensaver, serving as a spirit booster, soothing tired bodies with the inspiration that paradise awaits,” Rep. Alvarez said in his speech. He said if a local tourist spends three days in the Calamianes, on the average, he or she will be contributing P12,000 to the local economy. If it is a foreign tourist, he said the contribution could P18,000 per capita contribution for a 72-hour stay. “Ang negosyo ay umuunlad sa paulit-ulit na mga customer o mga customer na nagsasagawa ng word-of-mouth referrals,” he said. Rep. Alvarez also cited in his speech the initiative of his father, former House representative Antonio Alvarez, to construct the FBR with the help of the Korean International Cooperation Agency (KOICA). In a press statement released by CAAP also Tuesday, it said that in 2017, Busuanga Airport catered to 525,044 passengers, a 63.26% increase from the 321,595 passengers it received in 2016. “The government recognizes that an airport such as Busuanga Airport will provide a further boost to the movement of various trade activities and contribute to the development of the islands’ local and regional economy,” it said. With the development project, the DOTr and CAAP also hope to help establish a transportation framework for an economically feasible and sustainable tourism development in the region. Busuanga Airport aims to serve as the main gateway to the Calamian Group of Islands Tourism Cluster, an area comprising of the islands of Linapacan, Busuanga, Coron, and Culion, which are hosting a number of high potential tourist attractions such as pristine beaches and diving spots that feature coral reefs and sunken World War II Japanese shipwrecks. “In order to realize this, improvements in the islands’ main gateway are being actively pushed by the DOTr and CAAP,” it said. 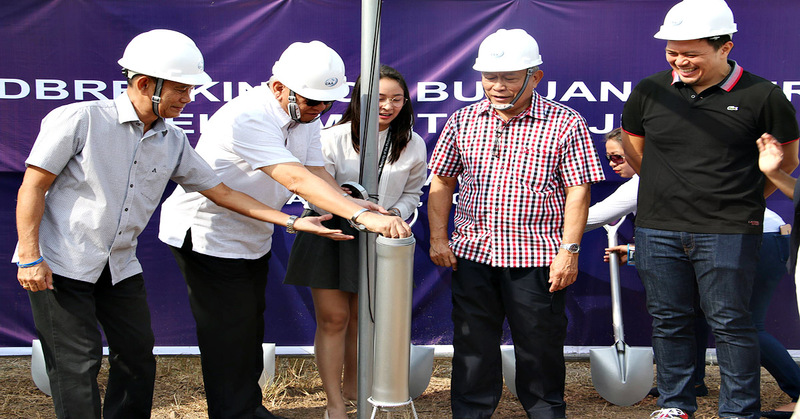 Busuanga Airport development project’s groundbreaking is only one of the 25 more future big-ticket aviation-related projects the DOTr and CAAP are launching with a 2020-2022 timeline. Among the other projects include the construction of the Bicol International Airport, the relocation of Dumaguete Airport, the construction of a new passenger terminal building (PTB) for Kalibo International Airport, and the improvement of the landside and airside facilities at Laoag International Airport. Present during the groundbreaking ceremony were CAAP director general Capt. Jim Sydiongco, Busuanga Mayor Elizabeth Cervantes, Coron Mayor Ajerico Barracoso, Culion Mayor Virginia De Vera, Linapacan Mayor Jessie Del Prado, and other LGU officials.